The Fieseler Fi 156 Storch (stork) was a small German liaison aircraft built by Fieseler before and during World War II, and production continued in other countries into the 1950s for the private market. It remains famous to this day for its excellent STOL performance, and French-built later variants often appear at air shows. In 1935, the RLM (Reichsluftfahrtministerium, Reich Aviation Ministry) put out a tender for a new Luftwaffe aircraft suitable for liaison, army co-operation (today called Forward Air Control), and medical evacuation, to several companies. 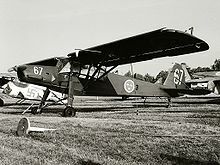 Conceived by chief designer Reinhold Mewes and technical director Erich Bachem, Fieseler's entry was by far the most advanced in terms of STOL (Short Take Off and Landing) performance. 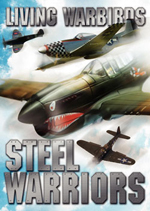 A fixed slat ran along the entire leading edge of the long wings, while the entire trailing edge, inspired by earlier 1930s Junkers "double-wing" aircraft wing control surface designs, including the ailerons, was a hinged and slotted flap. In a design feature rare for land-based aircraft, the wings on the Storch could be folded back along the fuselage in a manner not unlike that of the US Navy's F4F Wildcat fighter, allowing it to be carried on a trailer or even towed slowly behind a vehicle. The primary hinge for folding the wing rearwards was located in the wing root, where the rear wing spar met the cabin area. The long legs of the main landing gear contained oil-and-spring shock absorbers that compressed about 450 mm (18 inches) on landing, allowing the plane to set down almost anywhere. In flight they hung down, giving the aircraft the appearance of a very long-legged, big-winged bird, hence its nickname, Storch. With its very low landing speed the Storch often appeared to land vertically, or even backwards, in strong winds from directly ahead. A total of about 2,900 Fi 156s, mostly Cs, were produced from 1937 to 1945 at the Fieseler Factory in Kassel. In 1942 the production started in the Morane-Saulnier factory at Puteaux in France. Due to the demand for the Bf 109 and the Fw 190, the Storch production was shifted to the Leichtbau Budweis in Budweis in 1943. In 1944 the production was moved from the Leichtbau Budweis to the Mrx�z factory in Chocen which produced 138 examples of Fi 156, locally designated as K-65 Čx�p. Production ended in 1949. Immediately after the liberation of France in 1944, the production of Storch at the Morane-Saulnier factory was continued at the request of the Arm�e de l'Air and designated MS 500 for the batch of aircraft produced with the remaining stock of Argus engines. Further modification and use of different engines (inline and radial) are known under different type. The use of the plane in Indochina highlighted the weakness of the wood in the construction of the airframe; It was then decided to build the wings in metal. Among the modifications, the defensive weapon aiming through the back window was dropped, although some aircraft have then been modified on the field to take a Machine Gun MAC 34T firing through one of the side window. 141 aircraft were built before the end of WWII and a total of 925 aircraft were built before the end of the production of all type of Criquet by Morane-Saulnier in 1965. Licence production was also started in Romania in 1943 at the ICAR factory in Bucharest. Only 10 were built by the time Romania switched sides, with a further 70 aircraft being built by the Romanians before production ended in 1946. 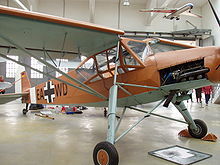 Because of its superb STOL characteristics (which would be of obvious great benefit to bush pilots, for example) there have been many attempts to recreate or outright copy the Storch in modern form, namely in the form of various homebuilt aircraft. One of the most successful recent examples of this is the Slepcev Storch designed by Nestor Slepcev. 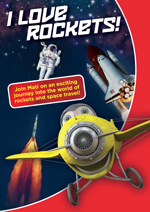 It is a 3/4 scale reproduction of the original with some modification for simplicity. Through the use of modern materials the aircraft features better STOL performance than the original with a take-off run of 30 m and landing-roll of 50 m with no headwind. 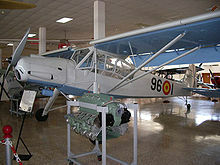 The Storch could be found on every front throughout the European and North African theaters of operation in World War II. It will probably always be most famous for its role in Operation Eiche, the rescue of deposed Italian dictator Benito Mussolini from a boulder-strewn mountain top near the Gran Sasso, surrounded by Italian troops. German commando Otto Skorzeny dropped with 90 paratroopers onto the peak and quickly captured it, but the problem remained of how to get back off. A Focke-Achgelis Fa 223 helicopter was sent, but it broke down en route. Instead, pilot Walter Gerlach flew in a Storch, landed in 30 m (100 ft), took aboard Mussolini and Skorzeny, and took off again in under 80 m (250 ft), even though the plane was overloaded. 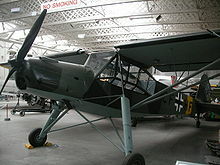 The Storch involved in rescuing Mussolini bore the radio code letters, or Stammkennzeichen, of "SJ + LL" in motion picture coverage of the daring rescue. On 26 April 1945 a Storch was one of the last planes to land on the improvised airstrip in the Tiergarten near the Brandenburg Gate during the Battle of Berlin and the death throes of the Third Reich. 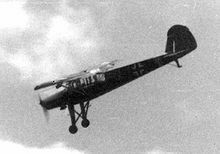 It was flown by the test pilot Hanna Reitsch, who flew her lover Field Marshal Robert Ritter von Greim from Munich to Berlin to answer a summons from Hitler. Once in Berlin von Greim was informed that he was to take over command of the Luftwaffe from Hermann Gx�ring. A Storch was the victim of the last dog fight on the Western Front and another was downed by a direct Allied counterpart of the Storch - an L-4 Grasshopper - from the L-4's crew directing their pistol fire at it. The pilot and co-pilot of the L-4, Lts. Duane Francis and Bill Martin, opened fire on the Storch with their .45 caliber pistols, forcing the German air crew to land and surrender. During the war a number of Storchs were captured by the Allies; the British having captured 145 from which 64 were given to the French as War compensation from Germany, one becoming the personal aircraft of Field Marshal Montgomery. The ALA and the ALAT use the Criquet from 1945 to 1958 throughout the Indochina War and the Algerian War. Fi 156 B - Allowed for the automatic retraction of the leading edge slats and had a number of minor aerodynamic cleanups, boosting the speed to 208 km/h (130 mph). The Luftwaffe didn't consider such a small difference to be important and the Fi-156 B was not produced. Fi 156 C-2 - two-seat observation type (which had a rear-mounted MG 15 machine gun for defense), produced in 1940. Fi 156 K-1 - Export version of the C-1 (Bought by Sweden). 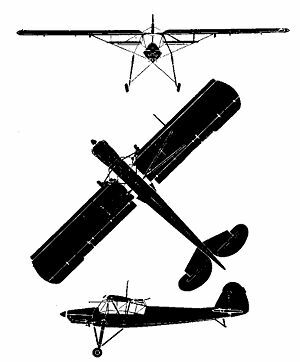 Fi 256 - A five seat civil version; two were built by Morane-Saulnier. MS-500 - Liaison version. French produced with 240 hp French built Argus engine. MS-502 - Liaison version. Identical to the MS-500, with the Argus engine replaced by a 230 hp Salmson 9ab radial engine. MS-504 - with a 304 hp Jacobs R-755-A2 radial engine. MS-505 - Observation version of the MS-500 with the Argus engine replaced by a 304 hp Jacobs R-755-A2 radial engine. MS-506 - with a 235 hp Lycoming engine. Mrx�z K-65 Čx�p - production in Czechoslovakia after WWII. Axworthy, Max. 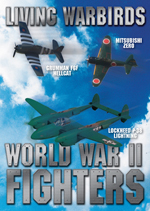 "On Three Fronts: Romania's Aircraft Industry During World War Two". Air Enthusiast, No.56, Winter 1994. Stamford, Lincs, UK:Key Publishing. ISSN 0143 5450. pp8-27. Bateson, Richard P. "Fieseler Fi 156 Storch". 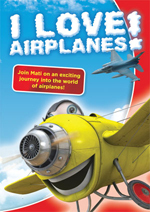 Aircraft in Profile, Volume 11. Widsor, Berkshire, UK: Profile Publications Ltd., 1972. Fieseler Fi 156 Pictures and Fieseler Fi 156 for Sale.